This neatly conceived double bill of operatic monodramas as part of the Grimeborn festival pairs Sir Peter Maxwell Davies’s 1981 The Medium with the European premiere of The Wanton Sublime by Tarik O’Regan, producing a strikingly immersive experience. Central to its success is the American mezzo Hai-Ting Chinn, who gives focused and intelligent performances that are attuned to the respective musical idioms. In The Medium, she is an unnamed clairvoyant, who performs straightforward palm readings before becoming possessed by a gamut of characters: a ‘good angel’ to whom she yields sexually, a haughty mistress with the shadow of a lost child, the child itself (a creepy changeling), a rabid bloodhound, and so on. By the end, our ‘medium’ is undergoing electroconvulsive therapy and we realise we have falsely rationalised her madness. For The Wanton Sublime, Hai-Ting Chinn swaps her light, high-necked Victorian dress for a sharp city suit. Setting a libretto by American poet Anna Rabinowitz, O’Regan – whose Heart of Darkness played at the Linbury Studio Theatre in 2011 – uses a nine-piece band (including electric guitar and drums) to underpin the journey of a Virgin Mary figure, stripped of her iconic symbolism and grappling in today’s world with her unasked-for role. Her journey begins with incredulity and disdain before finally reaching acceptance, by which point both music and text have attained a more sublime tone. 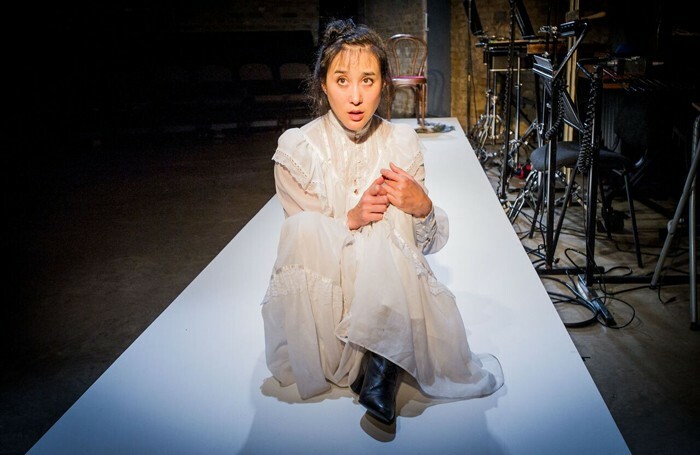 The Wanton Sublime is better suited to a broader performance space, while the Arcola’s intimate Studio 2 is perfect in conveying the claustrophobia and immediacy of The Medium.